I've been meaning to do a full post on my half bathroom for a while now. Small bathrooms are absolutely the hardest rooms to photograph which is why I've been putting this post off, but I finally just decided to jump right in and go for it. It's always best to start with a before picture, because then you can really appreciate the after. This bathroom felt small, dark, and orange. It was time for a change. 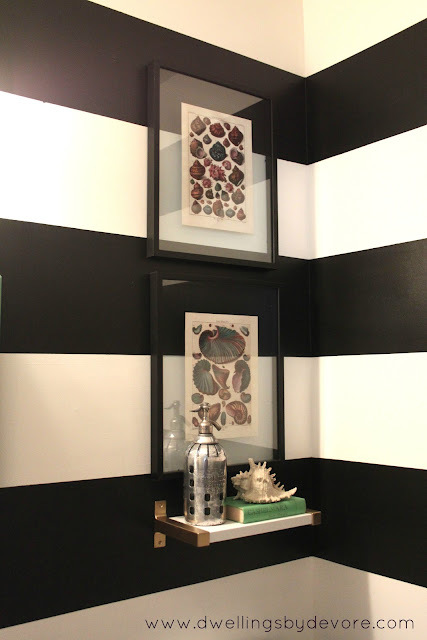 I'm loving black and white right now and decided to go bold with some horizontal stripes. 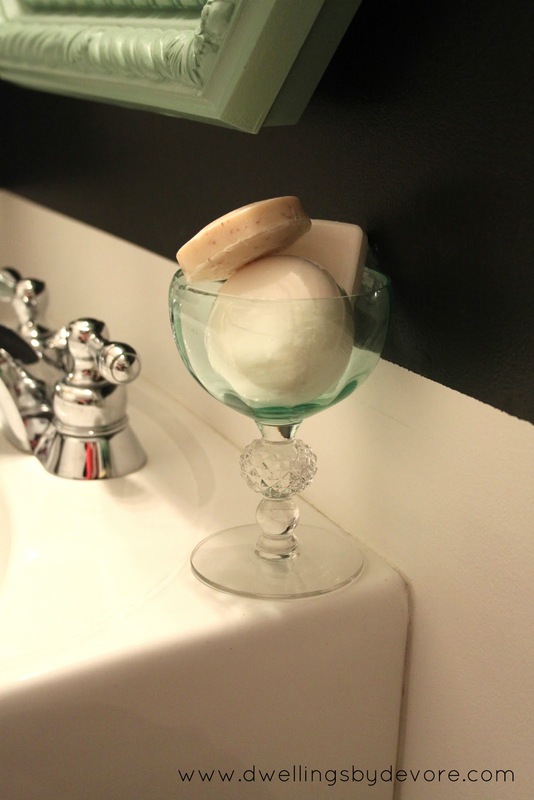 I would eventually love to add a fabric skirt to the bottom of the pedestal sink, but for now I'll leave it as is. 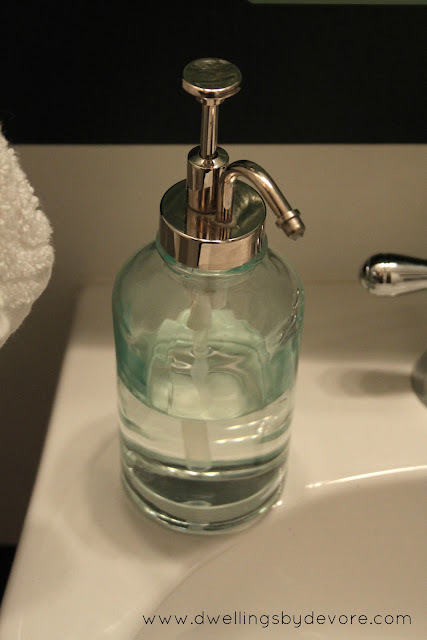 LOVE LOVE LOVE the bathroom! the black and white go so well with the teal and gold. I would love this in my home. Great job! You can't go wrong with B & W-and what a great job you did, it can't be easy getting those lines crisp. 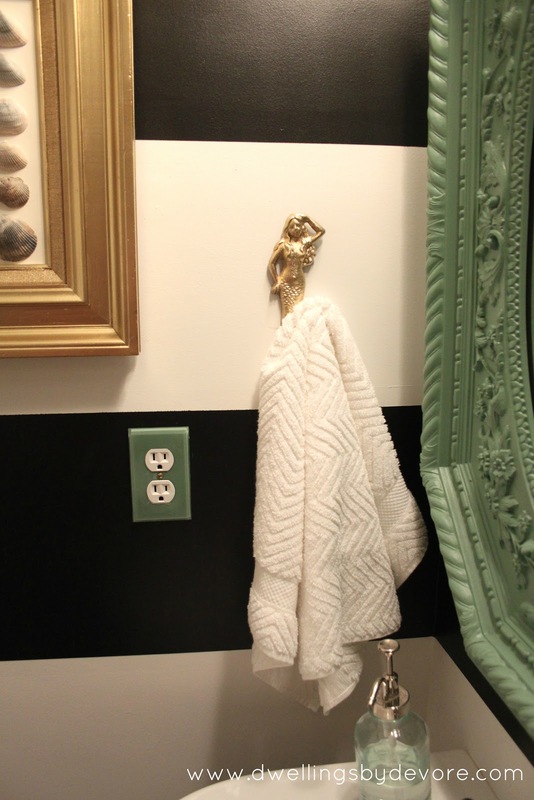 I really love the extra touches like the towel hook and outlet cover. 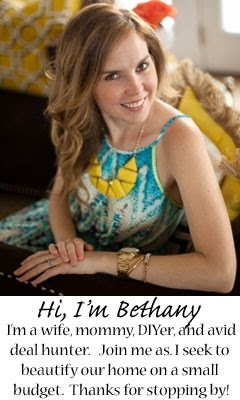 I think that your pictures turned out GREAT! 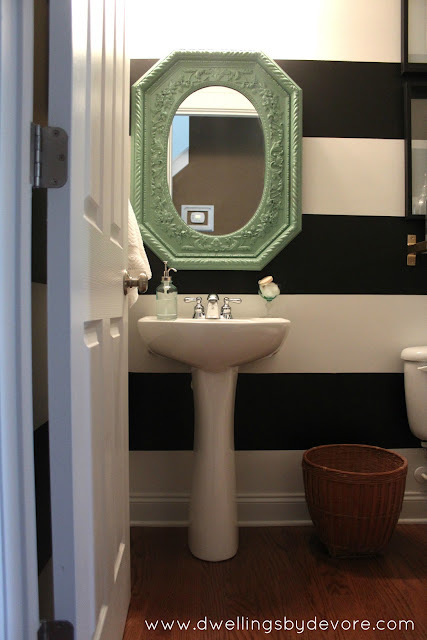 This bathroom is amazing...I love the black and white stripes! 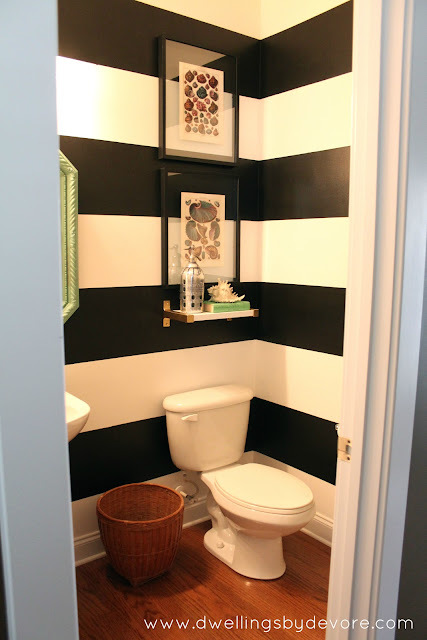 Love the stripes and black and white are killer! Great job! I absolutely love this!! I'm actually taking a break from painting my bathroom in stripes as we speak!! Lovely!! You rocked it again! 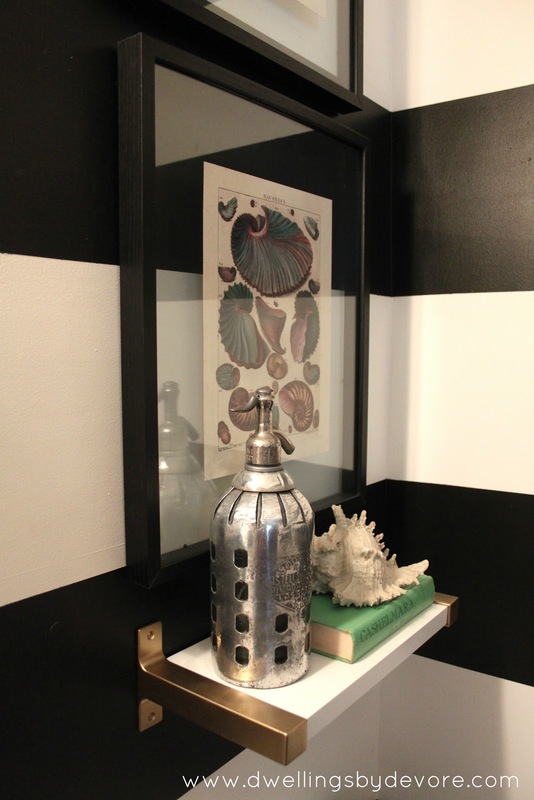 Of course I love black and white and horizontal stripes. And I know I've told you once already how much I love that gold mermaid! The mirror color is right down my alley and I love the gold brackets on the floating shelf! WOW! I LOVE what you've done. And you little details are wonderful. But I was wondering what your light fixture looks like. It's just "FAB"!!! This is so cool! love the bathroom - would love to do it to my powder room downstairs. thanks for sharing! oh i LOVE it! and that minty accent color with it is divine! 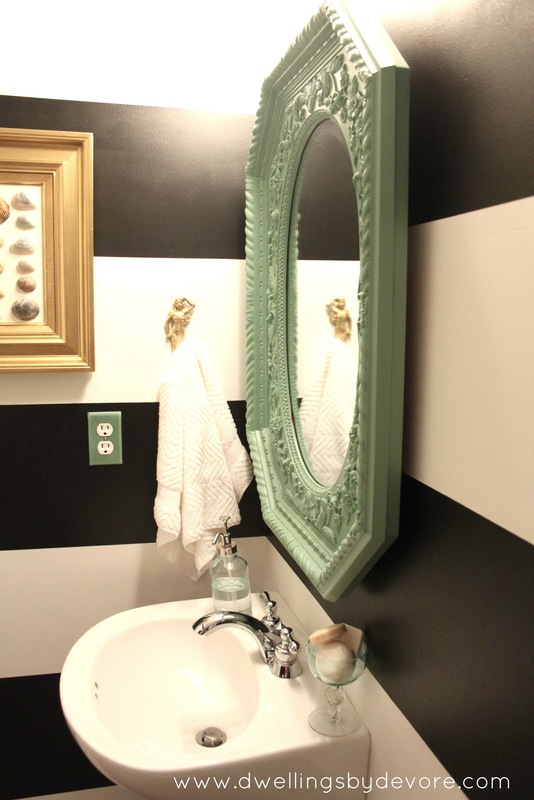 I love the black and white stripes. I never get tired of them. 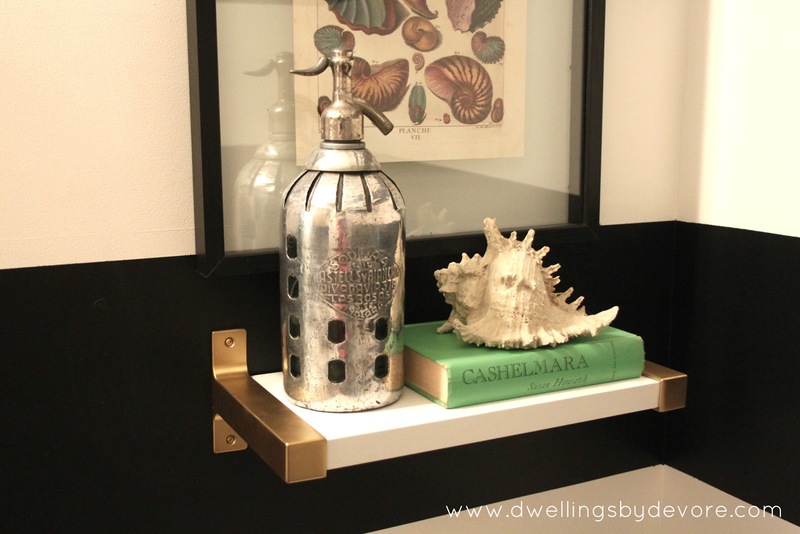 It was really inspired to paint the Ikea shelf brackets brass! I haven't seen that done before and it was really great looking. I love...this bathroom. I am so loving black and white as well right now and this bathroom hits it out of the park! Did you paint those stripes or did you use some sort of wallpaper material? 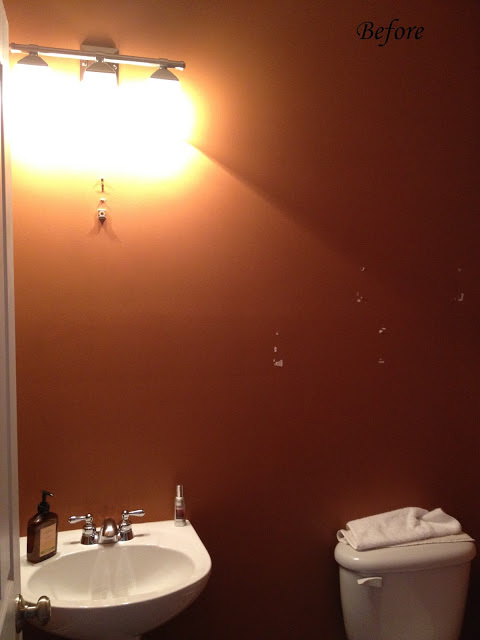 I am trying to come up with solutions for a ugly orange half bathroom as well :) Also, what is your favorite gold spray paint? Thank you! I just taped off the stripes using painters tape and a laser level. And my favorite gold spraypaint is Rustoleum Gold Metallic, it's the one with the shiny lid. How wide are the stripes and which paint colour are the white stripes? 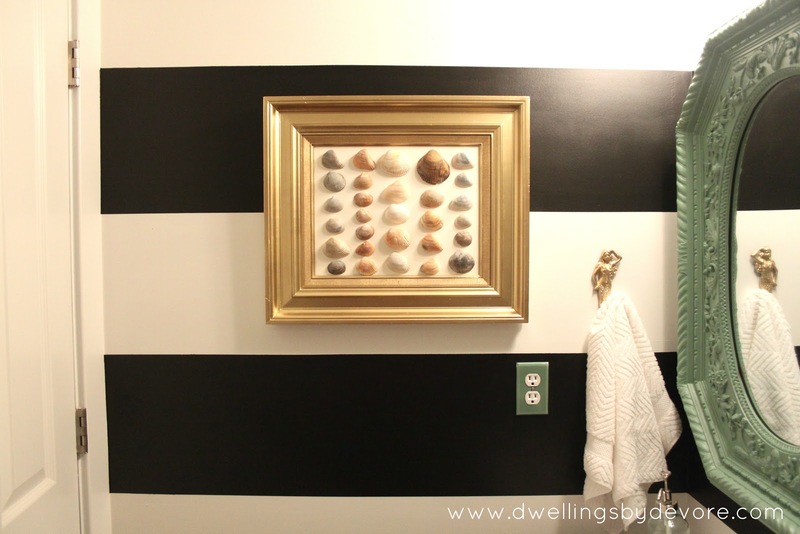 The stripes are 12 inches wide and I actually just used some white paint that I had on hand. I'm not sure of the exact color. Is the mermaid spray painted with the same color that is on the shelves?